Mr.Putin recognized for great contribution to relations with China and world peace. Chinese leader Xi Jinping has conferred upon Russian President Vladimir Putin China’s Order of Friendship. Putin is the first foreign leader to have been awarded this high Chinese state decoration. "President Putin is the first to have been awarded this order since China established a system of decorations for services of national importance. Putin as the leader of a great power of world influence is the founder of current Chinese-Russian relations and always advances their development at a high level," Xi said. As according to Tass, Russian state news agency " Starting from 2000 President Putin has been to China 19 times on a the state visit or for international events. He visited China more frequently than other world leaders. He is most familiar and respected in China," Xi said. "President Putin is my good and close friend. Putin thanked the Chinese leadership for this gesture of special attention, especially more particular for the long protracted nuclear stand-off and peaceful dialogues he has chaired between the western allies and North Korea. It is a great honor for me to be awarded this high government decoration - China’s Order of Friendship. I know that it was introduced just recently and today it is being awarded for the first time. 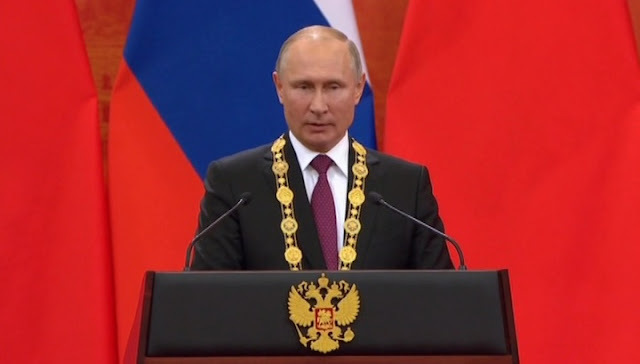 I cordially thank the Chinese friends for this gesture of special attention," Putin said at special ceremony hosted at the Great Hall of People, in China. He described this as a recognition of Russia’s efforts to advance comprehensive strategic partnership with China. He addressed personal thanks to Xi, whom he addressed as "dear friend." "We take note of not only what is being done, but also of the way it is being done. This, too, is a sign of special attention and respect, which certainly relies on our mutual national interests, the interests of our peoples and, of course, our personal friendly relations," Putin said. Russia sincerely appreciates its neighborliness and friendship with China. "We take pride in the common achievements in politics, the economy, science and culture and appreciate the achieved high level of interaction in the international scene. And, of course, we have firm confidence in the success of all of our undertakings," Putin said. He voiced the hope for further joint work for the sake of strengthening Russian-Chinese strategic interaction. The Order of Friendship was established on January 1, 2016. It can be awarded only to foreign nationals for special contributions to strengthening China’s statehood, to modernization and development of China’s relations and cooperation with other countries and to the cause of maintaining world peace. The order is gold-and-blue, its main elements being a dove of peace, the globe, a handshake and a lotus flower. Putin’s name in Russian language is engraved on the reverse side of the Order. This is not the first time Mr. Putin to given a special recognition by the people's Republic of China, in 2011 he was given a Confucius Peace Prize, the most dignified and resilient accolade that denote same consecration status equivalent to the rank of Buddhist monk. .